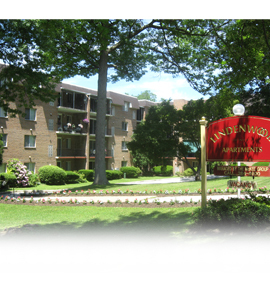 Lindenwood Apartments are exceptionally beautiful elevator apartments in the midst of a convenient, yet, quiet area. Penn Central train station, high speed trolley and bus stops, churches and excellent shopping are just minutes away. Based on a marketing survey before the planning of Lindenwood was started, apartment residents want quiet and secure apartments above all else. Keeping quiet and security in mind, the builder of Lindenwood had to meet unexcelled specifications using solid fireproof and soundproof materials. The apartments offer the security features of a voice intercom system to the outside front door. Each apartment has the extra protection of tamper-proof security locks. "I've lived in Lindenwood for six years and love it more today than when we moved in. When my husband and I sold our house we looked at nine apartment complexes between Drexel Hill and Broomall. Lindenwood is the last building we looked at. When Carolynn, the manager, opened the door and I saw the bright, cheery living room and very large balcony, I knew this was where I wanted to spend the rest of my life. At Lindenwood we have elevators, laundry facilities and trash chutes on each floor. We are one block from a food market (which does deliver) a bakery shop and pizza shop and a hairdresser who will pick up. Everyone is friendly and caring and waiting to welcome you into the Lindenwood family."